A revolutionary new construction product! SNAPO is the revolutionary new construction product that will excite children of all ages. Build in any direction with these brightly colored blocks that simply SNAP, SLIDE, or ROTATE together. This set includes a wide selection of different pieces to stimulate your imagination. Manufactured in the USA from the highest quality materials to create a durable product that will last for many years. 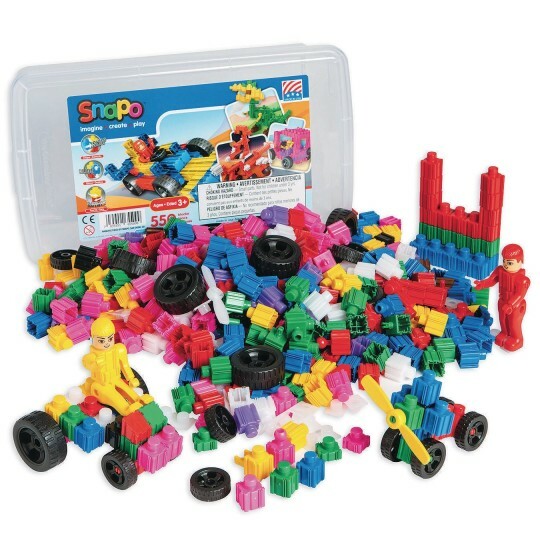 Contents include 550 pieces: basic cubes, wheels, propellers, single and double axles, sloped and flat tops, ball sockets, SNAPO action figure, and more.